I’m a fan of trompe l’oeil. I stand by my theory that mandating trompe l’oeil on abandoned buildings would revitalize neighborhoods by paying artists and creating foot traffic in areas otherwise forgotten – all the while adding beauty to buildings and creating distinct, local styles that take advantage of distinct, local problems of abandoned or boarded up buildings. That said, not every trompe l’oeil building need be an abandoned one – simply one that is either storied, has a good face to paint on, or unique approach to its style. Case in point. I circled back and came back down the bridge to take the above photo – and I had to see more, up close. 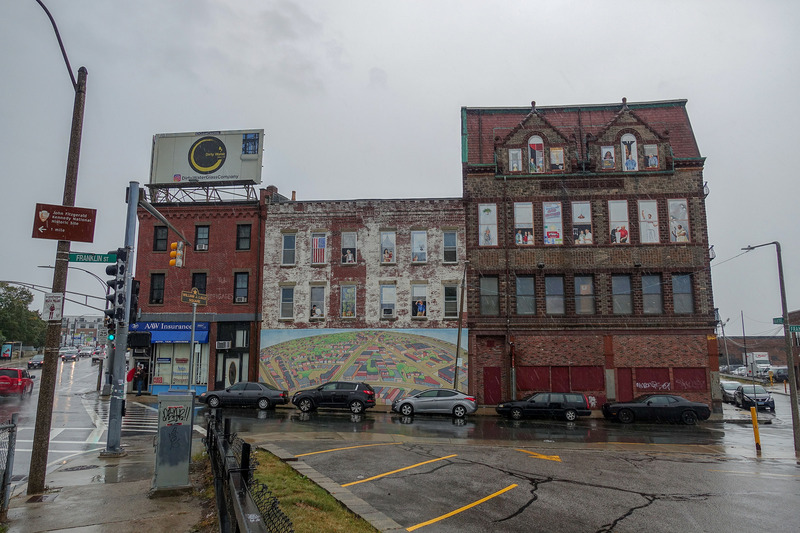 It was the mural that caught my eye but the trompe l’oeil that really took me by surprise (note the boarded up windows on the first floor of the building on the right, the Allston Hall Block – both storied (PDF, pp15-17) and partially boarded up – oh the irony!). So the mural is titled a birds eye view of allston village by the mayor’s mural crew, 2011 – some quick research and the trompe l’oeil portion is Windows On Allston by Elli Crocker, 2002. I love it. A good art is one I spend time just sort of gawking at, looking at from multiple angles, and all the while getting stares from pedestrians and drivers alike as I stand still and gaze upon something in deep contemplative thought – while they just go about their business unaware of the beauty around them. I spent a good 10-15 minutes with Windows On Allston. And if you’re anywhere near the intersection of Harvard Ave/Franklin St and Cambridge St in Allston you should stop by and see it – and get a meal at the nearby diner while you’re there!